With May being nearly five week month it gives me the opportunity the debut my first Cinema Spotlight List Series exploring the best of a specific movie tropes over the decades before counting down the best of the best of all time in that category. Similar to how I did my Best Movies of 2017 last year these lists will be posted once a week for the next four weeks with a cumulative list to be posted on Memorial Day, May 28th. So what is this series about? Well I figured I would start big by looking at the best three-piece movie franchises that have defined the history of cinema. I am of course talking about the Best Movie Trilogies of All Time and it all starts today exploring the best classic movie trilogies ranging from the beginning of film through the 1980s. So here they are, my picks for the Top 10 Classic Movie Trilogies. To set the ground rules for this list and beyond I am looking at trilogies that are all part of the same overlapping story. So no nontraditional trilogies here however those trilogies, ones that are related in theme more than story, will have their own list as part of this week-long celebration of the greatest trilogies of all time. So here’s how this works. I looked at trilogies within a given decade or time period and rated them based on their iconic status and legacy within the world of cinema. Over the next few weeks I’ll focus on the best modern classic movie trilogies (the 1990s and 2000s) and the best modern trilogies (the 2010s so far) as well as the best nontraditional trilogies as mentioned above. Today’s list focuses on true classics, trilogies release during and before the 1980s. Because some trilogies didn’t conclude within a certain decade I counted a trilogy as part of the decade where most of the films were released. So if two of the three movies were released in the 80s but the third was in the 90s it’s considered an 80s trilogy. ALSO, I will not be counting ANY series that has expanded beyond a trilogy as of May of 2018. So you won’t see “Indian Jones”, “Die Hard” or “Alien” on these lists as those are examples of franchises that expanded beyond their third films without a full-on or confirmed designated reboot. If a series was rebooted after the third film, like the “Mad Max” series and “X-Men” franchise, or expanded on in a new series of film separate from the first three the original standalone trilogy can count. Movies that as of May of 2018 remain a trilogy, even if a fourth one is rumored or truly is in the works, were considered. Anyways that’s a lot to take in, but in order to do justice to the large amount of credible and amazing trilogies I had to be picky with who could qualify. The TOP FOUR of each list will be in the running for my Top 10 Greatest Movie Trilogies of All Time on Memorial Day. Stay tuned for the rest of the series over the course of May. I hope you guys enjoy these lists. I worked hard on them and put a lot of thought, time and research into them so let me know what you think. Also let me know what your favorite classic movie trilogy is in the comments below. Let’s get started! Before David Cronanburg and Jeff Goldblum turned “The Fly” into a legendary example of sci-fi body horror the original 1958 film spawned one of the first major science fiction franchises with the original “The Fly” debuting in 1958 and followed by “Return of the Fly” the next year and concluding with “Curse of the Fly” in 1965. While the third film is often considered the weakest, failing to live up to the continuity of the first two while presenting an extension of the overarching family story, all three together are today considered a classic movie trilogy and have been rereleased as a package several times. The trilogy chronicles the impact of teleportation experiments on the Delambre bloodline after a fly interrupts the initial human trials. The result was one of the most grotesque (for its time) science fiction tales anyone had ever seen to that point. Criticized upon release for their disturbing images, “The Fly” and its sequels went on to become iconic genre classics to the point where the third film was criticized for its inability to reach the same level of quality entertainment as its predecessors. While not every entry was cinematic gold this trio of movies stands as an inspiring collection that has had a lasting impact on science fiction writers and directors to this day. The may not have aged quite as well as others on this list, but that doesn’t keep them from standing out. While also being individual standalone stories, Columbia Pictures three “Sinbad” films are also part of the same extended tale in the fantasy genre. Composed of “The 7th Voyage of Sinbad”, “The Golden Voyage of Sinbad” and “Sinbad and the Eye of the Tiger” this trilogy helped build on the popularity of stop motion animation years after the likes of “King Kong” made the shooting style relevant. Released at a time where adventure and mythical creature features were still relevant, “The 7th Voyage of Sinbad” holds a rare perfect score on Rotten Tomatoes and is considered the superior film in the trilogy. The other two movies were released in the 70s and are often overshadowed but remain classics in their own right. The sequel, “The Golden Voyage of Sinbad”, won the first ever Saturn Award for Best Fantasy Film and also received favorable reviews while the third film was less lauded and lost out to another trilogy starter, “Star Wars”. Still the special effects and pacing of all three movies, which focus on the same hero in the same continuity but also hold up well on their own, remain legendary in the cinematic world and the storytelling gave life to an iconic adventure hero who today is still ingrained in pop culture. The “Sinbad” series even helped inspire some of the greatest fantasy filmmakers of today, including Peter Jackson, so its place in movie history should not be underestimated. I wouldn’t be surprised if you aren’t aware of this legendary series of Japanese films, but I can bet you’re at least familiar with the influence they had on the medium. This series, released consecutively from 1954 to 1956, includes “Samurai I: Musashi Miyamoto”, “Samurai II: Duel at Achijoji Temple”, and “Samurai III: Duel at Ganryu Island” and focuses on legendary philosopher and Japanese duelist Musashi Miyamoto , depicting his evolution from a young soldier to a philosophical warrior including several duels as hinted at by the titles. It’s one of, if not the, most iconic series of samurai movies to ever come out of Japan with the first movie earning an Academy Award for Best Foreign Language Film. Today the trilogy remains popular for its influence on the genre and filmmakers still turn to it for guidance on choreography and presentation today. Quentin Tarantino’s “Pulp Fiction” is probably the most memorable project to borrow from the trilogy while the films individually have popped up in the collections of famous film nerds for years. The “Samurai” trilogy’s legacy has made it a must see for foreign film buffs and it remains a fine example of character building to fit a larger, multi-movie story. It truly is a character-driven tale fully realized on film. Not an American trilogy but celebrated all the same, the “Sissi” series is a popular Austrian trio of films focusing on the life of Empress Elisabeth of Austria. Composed of “Sissi”, “The Young Empress” and “Fateful Years of an Empress”, all with Romy Schneider in the titular role, the trio of films are all celebrated in German-speaking countries and Hungary to this day and have evolved into Christmas classics. They were all released as a unit in the United States in 1962 as “Forever My Love” and eventually became an internationally beloved franchise dubbed in several languages as a series of traditional classics stretching well beyond their Austrian origins. Following one continuous story of the growth and maturity of the real life Sissi, this trilogy is today a cultural must-see and one of the most celebrated and recognized non-Japanese or English speaking film trilogies ever produced. It proved to be a breakout series for Rory Schneider who portrayed the role in a different light in 1972’s “Ludwig” and remains forever attached to the role. Few film series have managed to break language and cultural barriers like the “Sissi” series. The first film alone has gained respect as a work of art in biographical storytelling that is often imitated but seldom duplicated today. While yes there are four films in the “Mad Max” franchise, the first three are a standalone trilogy while the much beloved “Fury Road” is a certified modern reboot with a new cast on board for a potential new franchise. Containing “Mad Max”, “The Road Warrior” and “Beyond Thunderdome”, the “Mad Max” trilogy not only sparked a career for star Mel Gibson it also introduced the world to George Miller’s gritty directing eventually becoming a legendary action franchise. Set in dystopian Australia, all three films take viewers into a desolate and dangerous future where murder, revenge, and societal collapse are recurring themes. Each of the individuals movies were critical darlings in their day and dominated the 80s as pieces of cinematic pop culture that combined artistic action with over-the-top violence and thrills for a perfect blend of quirky post-apocalyptic fun. These films, separately and collectively, became fan favorites which are still enjoyed today for their dependence on practical effects and committed performances by both Gibson and others in the franchise. This is probably why “Fury Road” became such a massive hit, continuing the support of the franchise as one of 2015’s biggest surprise successes both critically and commercially. Before “The Evil Dead” got an incredible reboot in 2013 the original trilogy became the first great modern horror franchise that succeeded on every level by bringing fans in to view a low-budget scream fest by then-unknown director Sam Raimi. The trilogy includes “The Evil Dead”, “Evil Dead II”, and “Army of Darkness” all focusing on hero Ash who has to match wits with evil demonic beings called Deadites. Introducing the world to the Necronomicon Ex-Mortis, aka the Book of the Dead, “The Evil Dead” franchise was mind-bending and uncompromising in its time and the violence and graphic content only built with every entry including the reboot. The trilogy led to a cult fan base that today still worships the films as some of the best in horror. They are all also critically loved horror classics holding the rare distinction of each entry in the franchise being certified fresh on Rotten Tomatoes and the first two films widely considered among the greatest horror movies ever made. The second film is also considered one of the best horror sequels ever made, so yeah this trilogy has a lot going for it. Its popularity has not slowed either. “The Evil Dead” series has become more than iconic. It was revolutionary for the medium and set a standard for horror that still holds true even 35-plus years later. Some may argue that this series doesn’t belong on this list because it could be considered a nontraditional trilogy but they’d be wrong. It’s all part of the same characters’ story making them continuations of each other in spirit so they work here. This trilogy contains three of the most iconic and memorable western films ever made, “A Fistful of Dollars”, “For a Few Dollars More” and “The Good, the Bad and the Ugly”, and they all star Clint Eastwood in possibly his most famous persona, the Man with No Name. These three films collectively debuted many of the genre clichés we have come to know and love from westerns today and debuted one of cinema’s most iconic characters which has made all three movies consistent fan favorites and must see projects for any movie buff even though they were produced in the 60s. The direction of Sergio Leone in all three films has also made them among the most artistically respected movies of the era as well with impeccable writing and character development, well designed and detailed sets, a now iconic shooting style, and a soundtrack that is now forever tied to the clichés of the Wild West. No list of trilogies of any kind would be complete without this collection so it’s fitting that it’s the first to qualify for my best of all-time list later this month. One of the most enduring and beloved classic trilogies of all time is this Robert Zemeckis led science fiction trio, “Back to the Future”. 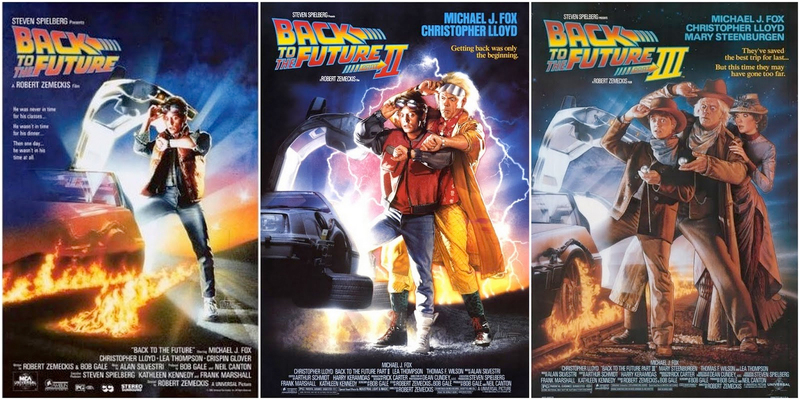 Comprised of three parts, one taking place in 1955 another predominantly in 2015 and the final in the old west of 1885 the three films follow Marty McFly and Doctor Emmitt Brown as they explore time travel using Brown’s DeLorean car converted into a futuristic time travel machine. All three films are known as relative master works of consistency, especially since the latter two utilized scenes and characters from the first film to tell an overlapping story. The is partially because the sequel films were produced at the same time in one of the first notably successful attempts of taking such a risk (the “Superman” movies tried but didn’t pull it off quite as well). This practice, plus the many time travel rules and themes of the film, would permeate through pop culture and filmmaking for generations with other directors embracing the practice of filming a series all at once for future franchises. It’s hard to deny “Back to the Future’s” cultural impact even today as the three films together stand as one of the most iconic science fiction stories in history and there are no plans for a reboot or a fourth film anytime soon as Zemeckis controls the rights to the franchise and has blocked any attempt to stain the franchise with unneeded sequels and if you’ve seen these three films you know the trio are perfect left just as they are. One of the most legendary films of all time, and a contender for many as the best ever, spawned a three-part franchise that today remains one of the most celebrated trios of films ever conceived. If it weren’t for the imperfect third entry in the series this trilogy might have taken the top spot, but there’s no getting around the fact that the first two movies are among the best cinematic works out there and even with its flaws the third film is still strong on its own. Chronicling the Corleone crime family and its legacy and evolution, “The Godfather” trilogy sports some of the medium’s most legendary performances including a Best Actor winning role for Marlon Brando and a Best Supporting Actor winning performance by Robert De Niro while the first two movies achieved extremely rare success by both winning Best Picture, one in 1973 and the other in 1975. Highly quotable, impeccably written and acted, and recognized as some of the most beloved and legendary movies in cinematic history the trio of “Godfather” movies reinvented and popularized the gangster trope in film and showcased a complete and engaging story that delved into the depth of the criminal underworld like never before. Maybe this is why the first movie is still considered one of the best and the sequel is highly praised as one of the most perfectly conceived cinematic sequels of all time. There are few, if any, trilogies more iconic than this. A self-contained trilogy of space operas, the “Star Wars” trilogy that started it all exploded into a massive phenomenon still going strong today and even spawning a prequel trilogy and a sequel trilogy currently in progress. Together “A Hew Hope”, “The Empire Strikes Back” and “Return of the Jedi” are a near perfect series of films that tell the tale of Luke Skywalker’s evolution from whiny orphan to heroic Jedi master and introduced some of the most iconic characters in all of film like Yoda, Han Solo and Darth Vader who is widely considered one of the greatest villains in all of cinema. Fans live and die by this series and its subtle but symbolic takes on religion and fate with merchandise, literature, and even side-story films all making up the empire that is the “Star Wars” franchise. And it all started with one epic trilogy that contains some of the best one-liners, classic special effects, memorable characters and an iconic twist to create a fully realized experience few trilogies have ever managed to replicate. When a trilogy is so cherished and beloved that it spawns not one but TWO additional standalone trilogy stories and is responsible for launching one of the largest film properties ever conceived there’s no way it could be anywhere else on this list than at the very top.